Shares fell along with the broader market following a sharp rally for the retailer's stock earlier in 2018. 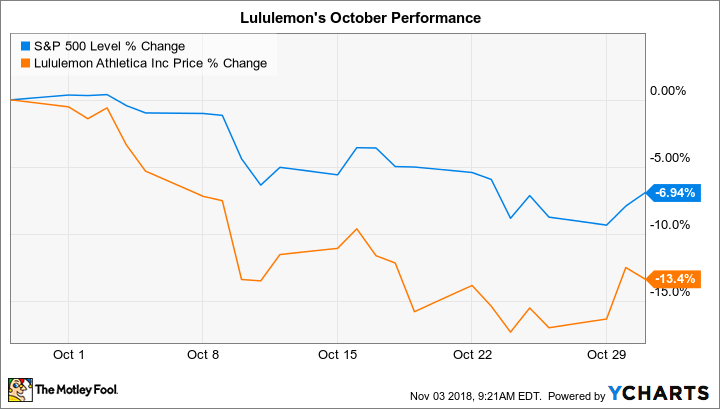 Yoga-wear specialist lululemon athletica (NASDAQ:LULU) lagged the market last month, falling 13% compared to a 7% slump in the S&P 500, according to data provided by S&P Global Market Intelligence. The decline coincided with a sharp drawdown for the broader market, and especially for stocks that had recently posted significant gains. Lululemon fits into that category, as shares remain up roughly 80% so far in 2018 even after last month's slump. There wasn't any company-specific news to drive shares lower last month. Instead, Lululemon's stock simply followed rivals lower earlier in the month. It rebounded slightly in October's final days, though, after peer Under Armour announced surprisingly strong third-quarter results. Lululemon has a much brighter outlook than Under Armour for the critical holiday shopping season. Specifically, the retailer sees fourth-quarter revenue reaching to between $720 million and $730 million as sales at existing locations rise by a low teen percentage. In addition to that market-thumping growth pace, investors are hoping Lululemon continues posting healthy growth in its gross and operating profit margins, which would be further proof that its latest products are resonating with its core customer base.